Every spring, the California gray whales journey with their newborn calves from the protected lagoons of western Baja to their ancestral feeding grounds in the cold waters of the Bering Sea. The whales migrating past Point Cabrillo belong to the eastern Pacific gray whale population of roughly 18,000 to 23,000 individuals. These figures vary year to year, but represent a strong recovery of the population since attempts to ban hunting of the grays were initiated by international treaty in 1937. The eastern Pacific grey whales pass by Point Cabrillo twice, on their southward journey from late November into February, and again going north between February and early May. They do not migrate simultaneously, and not all the whales make it all the way to Baja. 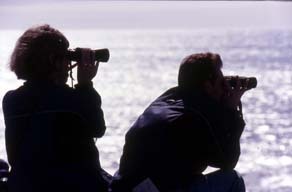 Some linger off shore; observations suggest that these are primarily the younger males. Newly pregnant females lead the northward migration, followed by males, and the last to leave Baja are usually females with babies.